Natural Stone, Satin and Glass Finish. Only 25% of the Replacement Cost. In and Out! Quick Turn Around. 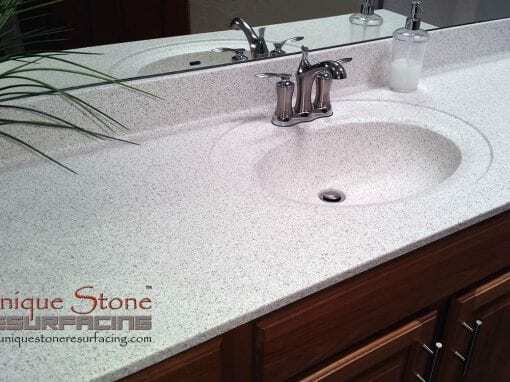 Unique Stone Resurfacing™ offers eight coats of product with every countertop resurfacing job. This allows for an application process that results in a thicker, more durable and consistent end product. In addition, there is a tremendous increase in strength which protects the surface from peeling and bubbling. Replacing a bathtub is expensive, invasive, and time-consuming. It requires tearing up the whole bathroom, messing with the plumbing, and can take weeks even in a pair of experienced hands. So what can you do? That’s where we come in. 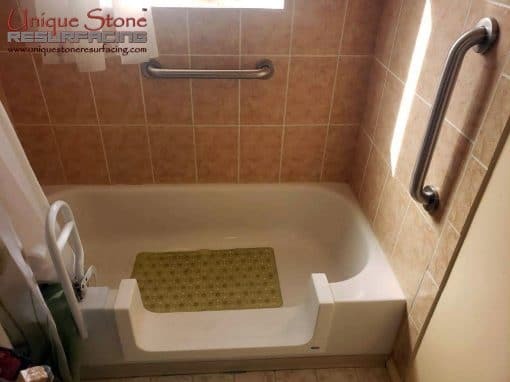 Walk In Bathtub ConversionSink resurfacing could save you as much as 50% or even more over chaotic removal and replacement. 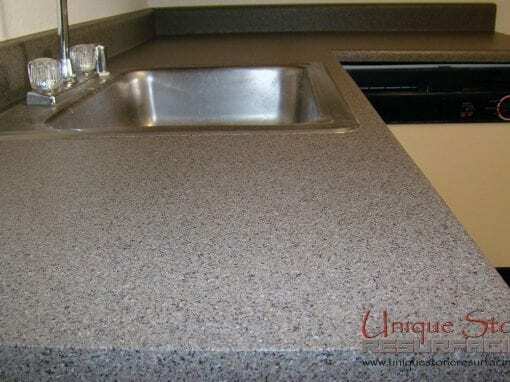 The older and more unique your sink is, the more costly replacement is going to be when compared with resurfacing. 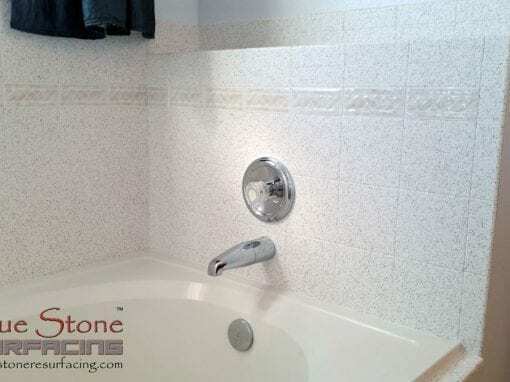 Tile resurfacing can be done on countertops, bathtub tiles, and wall tiles. 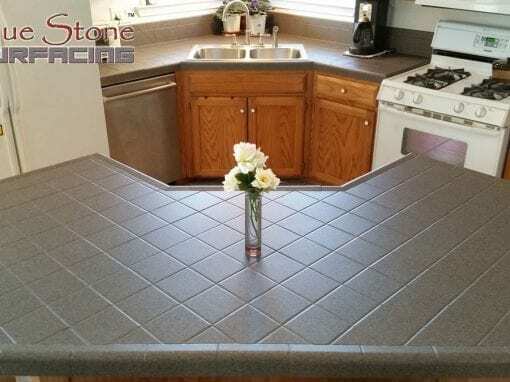 Choosing to resurface your tiles using Unique Stone Accents™ as opposed to replacing them can save easily over 50% of the replacement cost. Sink resurfacing could save you as much as 50% or even more over chaotic removal and replacement. 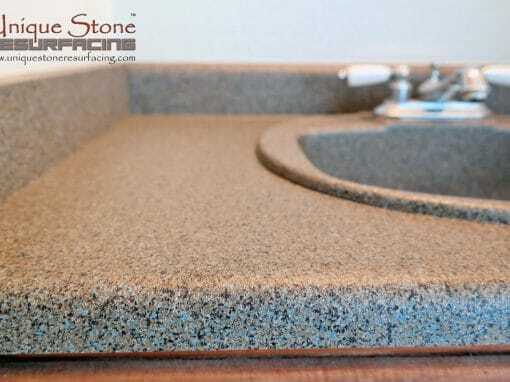 The older and more unique your sink is, the more costly replacement is going to be when compared with resurfacing. Our repairs could be effectively performed on all kinds of porcelain bathtubs, sinks, shower enclosure, tiles and even countertops. Here are some most common questions about our services. By a scheduled estimate with a sales representative. Each job is taken independently into consideration with a standard base pricing that will be discussed in person. It is of extreme importance we do not overlook any areas to ensure quality and longevity. 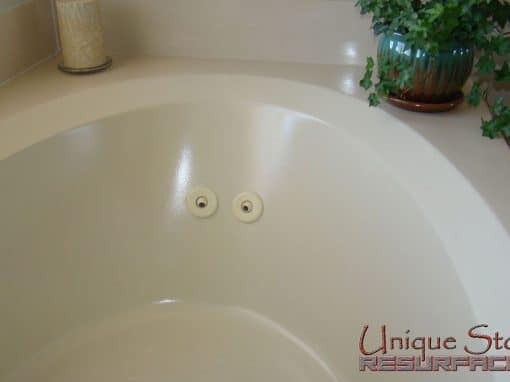 How long will bathtub refinishing last? Our Liquid Porcelain finish has a life span of 15 years plus! As long as the care instructions are followed. Kohler, American Standard, and Lasco don’t recommend harsh or abrasive cleaners; neither do we! 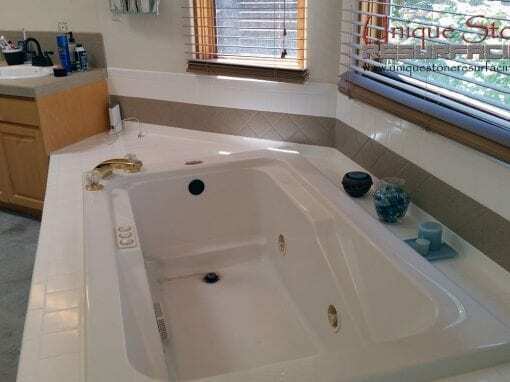 Can you refinish plastic or fiberglass bathtubs? 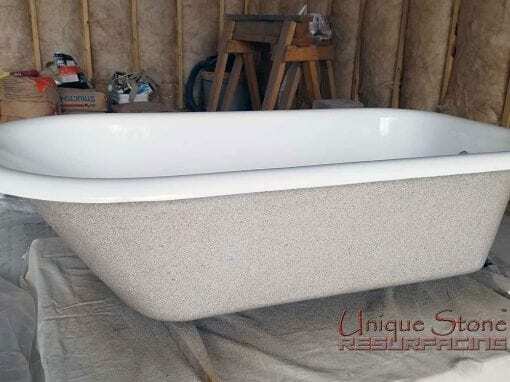 Plastic and fiberglass bathtub refinishing is similar to the process of repairing and resurfacing porcelain bathtubs. First, the surface must be chemically cleaned to remove any soap scum, mineral deposits, or body oils. Next, all cracks and chips are filled and sanded smooth. 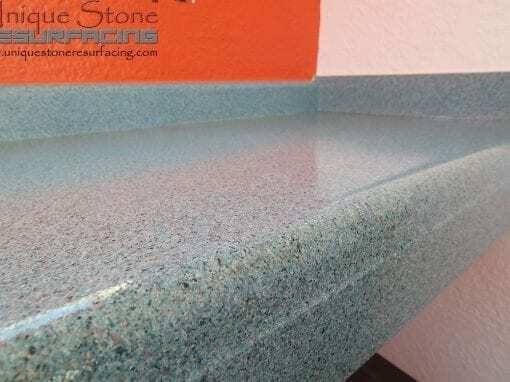 Then Unique Stone Resurfacing proprietary bonding agent is applied to ensure that the new finish adheres to the old surface. Finally, eight layers of acrylic enamel are sprayed sequentially to restore the original luster of the tub. 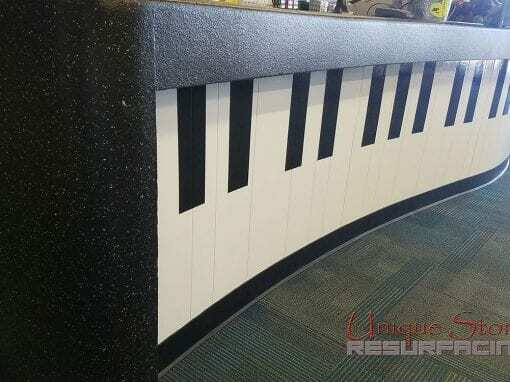 All refinished surfaces are warranted for a period of two years, against bubbling, peeling, discoloration or other failures of adhesion of the refinishing materials. How long will refinished countertop last? 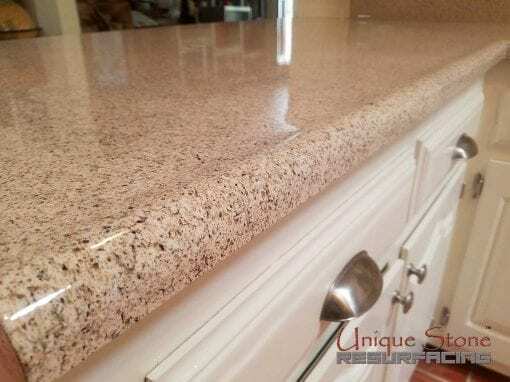 With proper care, refinished countertops can extend the useful life of your countertops to 15 years or more. 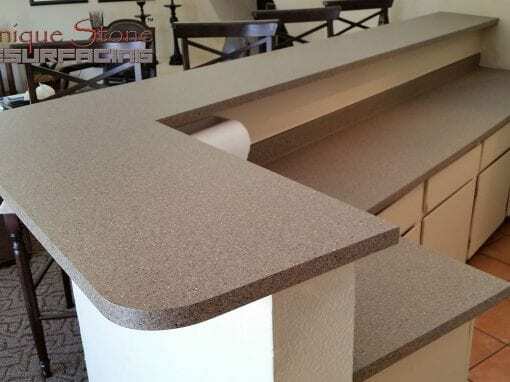 Our bonding agent creates a chemical bond between old and new surfaces, assuring you a long life for your refinished countertop. If you choose to refinish in Natural Stone finish the new surface will resemble the stone look. Glass finish will resemble the granite and Satin finish it’s just unique. 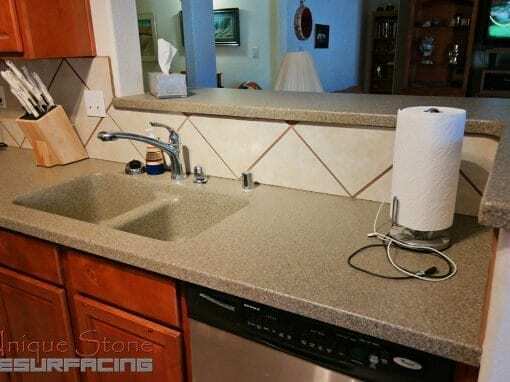 Most people will have a tough time telling any difference between our refinished countertop and a newly installed countertop. We are that good!